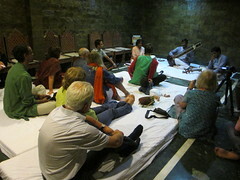 Sound Travels connects musicians and artists from within and without India. Below are a number of collaborations we’ve initiated or been involved with. In January 2013, Mercury-Award winning musician-producers Susheela Raman and Sam Mills were asked to curate the opening music event at the Jaipur Literature Festival. They invited the incredibly creative and talented master of ‘cello, Vincent Segal from France to come and spend some time listening to and exchanging musical ideas with some of Rajasthan’s statesmen of music. Sound Travels chose and contacted musicians from various backgrounds to rehearse at the Anokhi Farm in Jaipur for a few days. 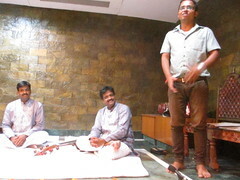 The resulting concert was a sensitive, joyful collaboration in which each musician was given space to lead the rest of the group and foreground their talent. Sound Travels has arranged rehearsal spaces, visas, taxis, cups of tea and more to facilitate the most exciting international collaboration with Rajasthani musicians. Produced by Mercury Award Nominated Susheela Raman and her husband Sam Mills, this collaboration has toured India and appeared at Queen Elizabeth Hall and the Royal Festival Hall at South Bank, London. Duncan Bridgman from One Giant Leap with… countless musicians! 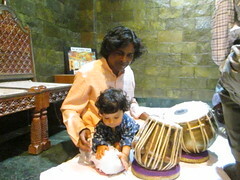 In January 2012, the One Giant Leap team landed up in Rajasthan and needed lots of musicians to work with, and quick! This was to be an awesome collaboration with at least twenty musicians on stage on the final night of the Jaipur Literature Festival 2012. Over the last four years harpist Georgie Pope and tabla and santaur player Kayam Ali Kawa have been performing together at private and public functions in India. In 2012-2013 Sound Travels organised a UK Arts Council-funded residency and collaboration between visual artist Rebecca Rose and a family of shadow puppeteers from Kerala who Georgie had met during one of her research trips.